Exactly 1,000 days after Britain voted to leave the European Union, and nine days before it is scheduled to walk out the door, Prime Minister Theresa May hit the pause button on Wednesday, asking the bloc to postpone the UK’s departure until June 30. EU leaders, who are exasperated by Britain’s Brexit melodrama, said they would only grant the extension if May could win the UK Parliament’s approval for her twice-rejected Brexit deal. Otherwise, the UK is facing a much longer delay to Brexit, or a chaotic “no-deal” departure from the bloc. In a letter to European Council President Donald Tusk, May acknowledged that the Brexit process “clearly will not be completed before 29 March, 2019” — the date fixed in law two years ago for Britain’s departure. In asking to delay Britain’s withdrawal until June 30, May said she would set out her reasons to EU leaders at a summit in Brussels on Thursday. British opposition politicians and pro-EU members of May’s Conservative government had urged a longer extension, saying a delay of just a few months could leave the country once again facing a chaotic no-deal Brexit this summer. Withdrawing without a deal could mean huge disruptions for businesses and U.K. residents, as well as those in the 27 remaining EU countries. But a long extension would infuriate the pro-Brexit wing of May’s divided party and would require Britain to participate in May 23-26 elections for the European Parliament. “As prime minister, I am not prepared to delay Brexit any further than June 30,” she told the House of Commons — a hint she could quit if Britain is forced to accept a longer pause. Any delay that required Britain to take part in European parliamentary elections would be a major headache for the bloc. 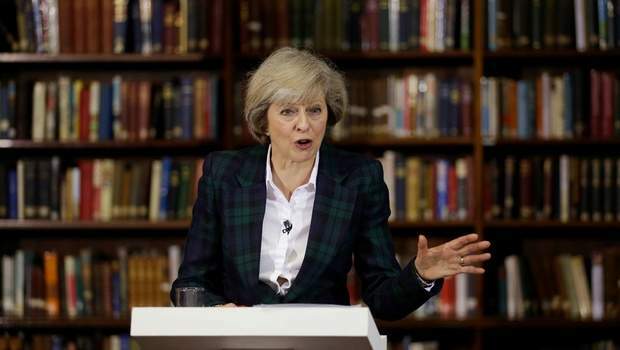 Britain’s seats already have been allocated to other countries to fill in the May election. Britain believes it would not have to participate if it got a three-month delay because the newly elected European Parliament is not due to convene until July. The official, who asked not to be identified because of the sensitivity of the situation, said Commission President Jean-Claude Juncker told May in a telephone call that “the withdrawal has to be complete before May 23,” the first day of the European elections. The alternative would be for Britain to participate in the elections and accept a much longer delay, to the end of 2019 or beyond. The EU is unwilling to give Britain more time unless the government can find a way out of the Brexit impasse. EU leaders are united in saying that the divorce deal it spent more than a year and a half negotiating with Britain can’t be renegotiated. But the deal has twice been rejected twice by hefty margins in Britain’s Parliament, amid opposition from pro-Brexit and pro-EU lawmakers. May had planned to try again this week to get the agreement approved until the speaker of the House of Commons ruled that she can’t ask Parliament to vote on the deal again unless it is substantially changed. Both sides of Britain’s Brexit divide were equally unimpressed with May’s request for a delay. Opposition Labour Party lawmaker Angela Eagle said May should “stop banging her head against the brick wall of her defeated deal” and seek cross-party support for a new Brexit strategy. From Washington, Donald Trump Jr. said May should have listened to his father, who urged her last year to sue the EU in order to secure better departure terms. The U.S. president has criticized May for not taking his advice. EU leaders are unlikely to agree to give final approval for a delay until Parliament has voted again on May’s deal, probably next week. Tusk said he didn’t foresee having to call an emergency summit next week to approve the extension, which could be done in writing. “Even if the hope for a final success may seem frail, even illusory, and although Brexit fatigue is increasingly visible and justified, we cannot give up seeking until the very last moment a positive solution,” Tusk said in Brussels. Juncker said Britain’s Parliament needed to decide whether it would approve the only deal that is on the table.